The camera on the left is my Canon PowerShot S70. It doesn’t have tri-band 3G connectivity, GPS or a built-in compass, nor can it check your email, send/receive text messages or browse the web. But it does come with a cable that connects to your TV so you can show photos and videos to friends and family. On the right is the Nokia N97, which has a slightly smaller 5-megapixel sensor but can also capture VGA video. It too has the ability to connect to a TV just like my Canon — but Nokia decided for some reason not to include the cable with your purchase. On a flagship handset that’s a pretty serious omission. You’ll also notice that the N97 is the first Nseries device with a full QWERTY keypad; therefore you wouldn’t be crazy for expecting a full install of QuickOffice to be on board, like Nokia’s Eseries line and very much unlike the nearly-useless read-only version of QuickOffice that comes on other Nseries models. The good news is that OfficeSuite — a superior alternative in my opinion — works great on the N97 and its touch-enabled screen. Even better, you have a fully-functioning 30-day trial to see for yourself. And better still, last time I checked you can transfer your OfficeSuite license to a new S60 handset once the time comes. The bad news is that you have to pay for an office suite in the first place — again, not at all a good thing for Nokia’s “no compromises” smartphone. If Nokia is so serious about making a dent in the North American market with the N97, why are they nickel and diming us with the stuff that sets it apart from other high-end handsets in the first place? Chime in with any ideas in the comments below, because I sure don’t have any…! This entry was posted in Mobile and tagged N97, Nokia, Nseries. Bookmark the permalink. 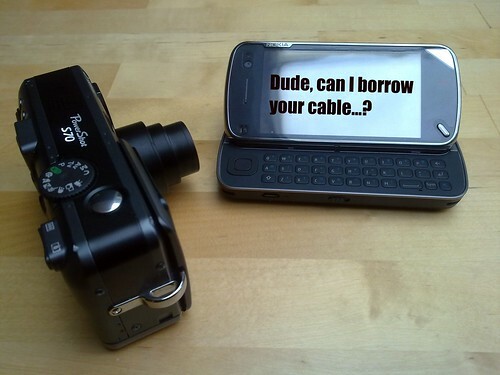 I’m guessing, but maybe Nokia N97 buyers already have the TV-out cable from their previous phones. I still have 3 lying around. Yeah, everybody says that… But what about someone like me who’s never owned an Nseries device before. I was surprised that the N97 didn’t come with a Office suite as well. I had visions of composing blog drafts on the unit sitting @ a Starbucks. I’m going to look into buying QuickOffice. I’m using my TV-Out cable that came with the N82. I don’t use it much, to be honest, but love that I can on my N82 and N97. I’m going to look into buying QuickOffice. You mean OfficeSuite, I hope!